Test results & snow in Florence! Going down down down! Little dance of joy (for Springsteen fans: http://goo.gl/cYaxh)! my blood viscosity is still a bit above normal, but I would like to mention that it is the lowest it’s EVER been (well, slight correction: since 2005, anyway…my earlier, before-2005 tests are in an old file that I haven’t opened in ages): 34 mm/hour. The high end of the normal range is 25; mine has been known to go over 90! total protein is down from 9.8 to 9.2, which is still above the reference range but not by much. B2M is down from 2.9 to 2.6. Squeals of joy! total IgG went from 3930 to 3640. Holy cats. It hasn’t been that low in more than a year. More than a year! MORE THAN A YEAR! Going down down down down…yeah! my albumin/globulin ratio is the closest it’s been to the normal range since 2009: 1.06 (= not far from 1.10!). Vitamin D is fine, totally within the normal range. No change in my IgA and IgM, which, according to the range, are similar to the IgA and IgM of a 0-1 month old baby…Uhmmmm, no comment! 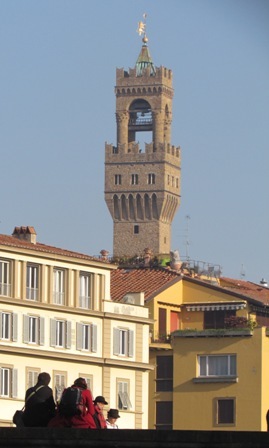 So, in conclusion: I’m still stable and going strong…AND tonight it’s supposed to snow in Florence. We should be getting quite a bit of snow, if the forecasts are right. Guggul (not Google! 🙂 ) is the common word for a tree called Commiphora mukul, which grows in India, Pakistan and Bangladesh. It produces a resinous sap that has been used forever in Indian traditional medicine (Ayurveda) to treat a variety of ailments, from obesity to atherosclerosis and osteoarthritis. Haven’t I heard that story before? Hmmm. At any rate, in modern times this sap has been processed and purified, and its active constituents have been isolated, extracted and encapsulated. Okay, it’s lunchtime…then I’ve planned a lazy afternoon watching movies in bed with my cats…Purrfect! 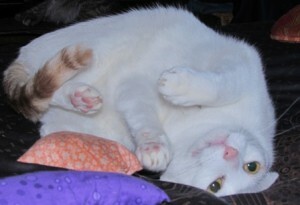 In the meantime, here is a photo I took just two days ago of Pinga, my baby, at play. She’s such a clown! 🙂 And that reminds me of this video, posted today on my Facebook profile by Lori (thanks! ): http://goo.gl/GggN5 Hehe. It’s really true that you learn something new every day. Until now, I thought that a cup of chamomile tea was useful only to help you relax . But it turns out that it might do much more than that. A few days ago I received an alert leading me to a 2009 (!) study on chamomile and COX-2, which is one of the unbelievably bad guys in myeloma (just do a search of my blog for COX-2, which, among other things, is a predictor of a poor outcome in myeloma…). 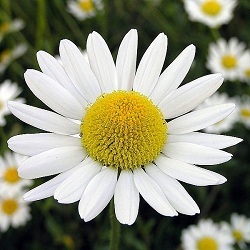 The full text is available for free online: http://goo.gl/5SJk2…Yes, it’s a bit technical, but if you read the important bits here and there, you will find out that chamomile inhibits a pesky inflammatory enzyme known as COX-2. It has antioxidant, hypocholesteroemic, anti-parasitic, anti-aging, and anticancer properties. Again, I had no idea. Chamomile also (see page 6) inhibits iNOS, which means “inducible nitric oxide synthase.” iNOS is a pathway linked to inflammation, which is , quelle surprise (not), also involved in myeloma, and not in a good way, believe me. Another good bit of news is that chamomile also inhibits something called PGE2, which is secreted by some types of myeloma cells (=the mutant RAS ones). PGE2 contributes to the cells’ resistance to melphalan, among other things. See: http://goo.gl/ArzGi Ah. And hey, check what the “Blood” study authors say at the end of the “Discussion” part: A recent study confirming the involvement of cox-2 and PGE2 in osteoclastogenesis suggests that up-regulated activity in mutant RAS myeloma could also contribute to progressive lytic bone disease. cox-2 inhibitors may, thus, be worthwhile agents for future therapy. So the hyperactive COX-2 and PGE2 also seem to help myeloma cells destroy our bones. Not good! Let’s compare that to the Conclusions of our “chamomile” study: The mechanism of action of chamomile on the inhibition of PGE2 production was due to the suppression of the COX-2 gene expression and direct inhibition of COX-2 enzyme activity. This may be important in the prevention of inflammation and may contribute to the antiinflammatory, anti-neoplastic and immunoregulatory effects of chamomile. Yay! I don’t know if my type of myeloma is mutant RAS or not…I read that 30-40% of myeloma patients have this sort of mutation, which is linked to not-so-lovely things such as disease progression and resistance to treatments. Well, one thing’s for sure: I’m going to begin drinking chamomile. Organic only, of course! P.S. Note: from what I’ve read, the type of chamomile with the strongest medicinal activity is the German Matricaria Recutita. I actually don’t have a huge amount of free time today. But I’m on a break, so here’s a quick post. 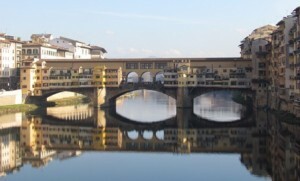 First, Arezzo: yesterday we spent a lovely relaxing day with friends (photo no. 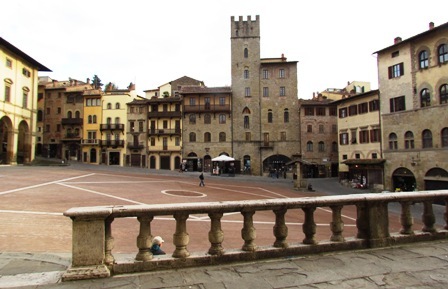 1 is of Arezzo’s sloping and splendid Piazza Grande), which ended with a superb afternoon tea. 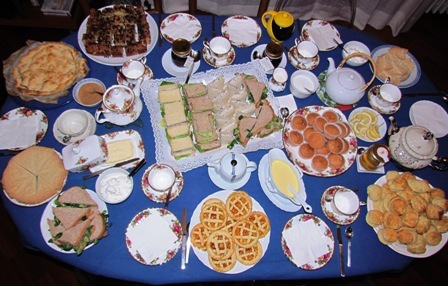 Yes, I know, there is no traditional three-tier cake stand on the table, but there were eight of us, and we were all quite hungry, so it made more sense to arrange the food on plates and platters. As you can see, we had four different types of homemade sandwiches, heaps of scones (lower right corner), shortbread (lower left, next to more sandwiches, and upper right), apple pie (upper left corner), one of my best coffee cakes (big hit, I’m happy to report; it’s that dark thing, next to the apple pie, going clockwise), muffins, small fruit tarts, whipped cream instead of clotted cream (we can’t get that here), homemade jams, crème anglaise to go with the pie…and five different types of tea, including an herbal one. My favorite: Simo’s traditional scones, the absolute best! This is something I am still checking out…a new target = myeloid-derived suppressor cells, or MDSCs, which play an important role in immune suppression: http://goo.gl/G6C8U Not surprisingly, curcumin prevents these pesky cells from interacting with cancer cells, which is obviously a good thing: http://goo.gl/9E8iq Will I ever cease to be amazed at the extraordinary properties of curcumin? Probably not. We spotted a coot swimming on the river Arno (can you believe that?) 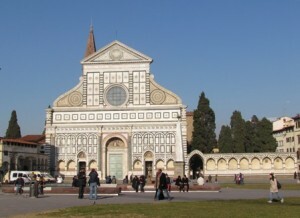 as well as several egrets, but the best part of our time in town was visiting the church of Santa Maria Novella (first photo). 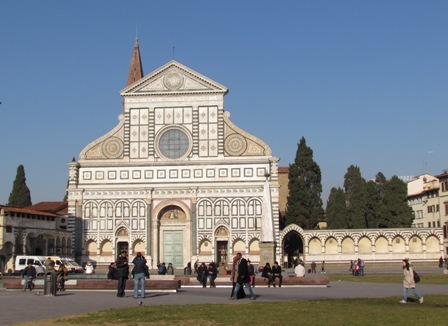 I hadn’t visited Santa Maria Novella in ages, mainly because in recent years Florence residents had to pay to visit it, and I thought that wasn’t fair. But last week a friend told me that it’s free now…for us (not for tourists). So today, since we were nearby, we went inside, and wow, it’s such a pretty church…I’d forgotten! Lots of important artwork, too (check http://goo.gl/AZBYt). 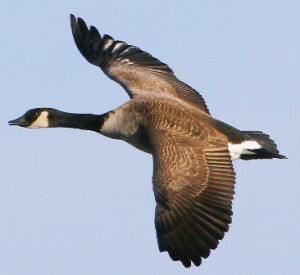 Once again, I would like to go way off topic to ask for your help in bringing Lucy, the Canada goose, home to her human family (for more info, see my January 17 2012 post). You (and your neighbours and friends and colleagues and…well, everyone!) can now sign an online petition to help Lucy: http://goo.gl/ym3nN. Two weeks ago, Lucy was free to fly/go wherever she wished…at any time. Now she is locked up, unable to fly. Does that make any sense? No…didn’t think so. Please sign this petition and ask everyone you know to sign, too! Thanks! Back in mid November, a blog reader (thanks, J!) posted a link on my blog’s Facebook Page about the development of a cancer vaccine called ImMucin, which, and here’s the exciting part!, was being tested in clinical trials on patients with multiple myeloma. Very exciting news. Today a third (!) blog reader sent me a link providing an update on the clinical trial: http://goo.gl/O4kRc (you can also check the Clinical Trials website: http://goo.gl/uNyMs). Here’s an interesting excerpt: The new vaccine works by activating the immune system by “training” T-cells to search and destroy cells with the MUC1 molecule, typically found only on cancer cells. More than 90% of common solid tumor cancers bear the MUC1 molecule, as well as many non-solid tumors, including lymphoma, leukemia and multiple myeloma. L also found out that dried parsley actually contains a higher amount of apigenin than fresh parsley. She calculated that 2.4 grams of dried parsley has the same amount of apigenin (300 mg) as 100 grams of fresh parsley. There is no reason for Lucy to be killed. No reason at all. It makes no sense. I also cc’d the generic Environment Canada address: enviroinfo@ec.gc.ca And I cc’d the Vancouver Sun reporter, Kelly Sinoski: ksinoski@vancouversun.com Same e-mail message. Easy peasy. I just read the story of Lucy, the Canada goose that was saved from certain death by Diane Vander Wiel a few years ago, when it was a mere chick. Well, last week federal wildlife officials took Lucy from the only home she has ever known, in Fort St. James. The reason I am writing to you is that there is a risk now that she will be killed. That’s outrageous. Simply outrageous. There is no reason for that. I would like to join the thousands of people who believe that Lucy should be given back to the Vander Wiel family. I hope you will intervene as soon as possible, before it’s too late. With all the horrible things that happen every day, I know it may seem silly to get all upset over a goose, but this story struck a chord with me. I put myself in Diane’s shoes: if federal authorities decided to take one of my cats away from me for no good reason at all (as in this Canadian case), well, I’d like someone to stick up for me. So that’s what I’m doing today.